Day Two of Sock Summit is behind me now, folks, and the whirlwind is still going strong. My feet hurt, I am 99% out of touch with non-knitting non-Portland world, but I’m just continuing to tell myself that’s OK because at the moment knitting world is going pretty great down here in Portland. Today, I got up, hung out with some knitters, listened and learned about design from Marjan Hammick (Yarnissima), and talked a little German with her, participated in a record-setting Guinness Book of World Records knit-in, bought more yarn, escaped to downtown for a delicious hamburger, investigated Powell’s bookstore where I scored a hardcover copy of Meg Swansen’s Knitting, bought cupcakes, and did a quick turnaround before heading out to the Sock Hop at the Portland Art museum. It continues to be pretty trippy, being here. 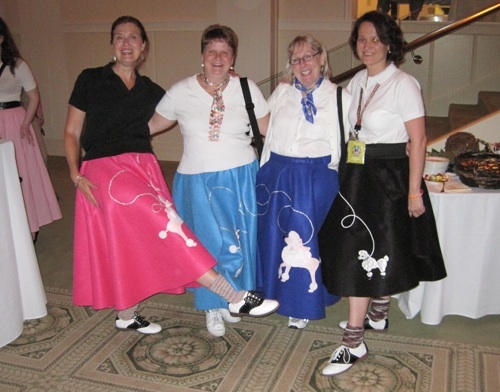 At the Sock Hop I chatted with a few people and commented that “you know, this is all pretty hysterical,” and whoever I was talking to would nod vigorously. 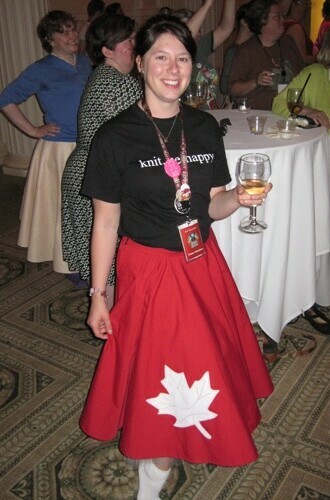 Someone (the Canadian gal above from Make One Yarn Studio whose name I cannot remember), added that it is hard to know “am I done?” at the end of the day/class/event/etc because it all sort of meshes and keeps on going in your head. At this point, any delusions I had about presenting photos or captions in any detailed or logical order is sort of breaking down, so I’ll just wing this a little bit. 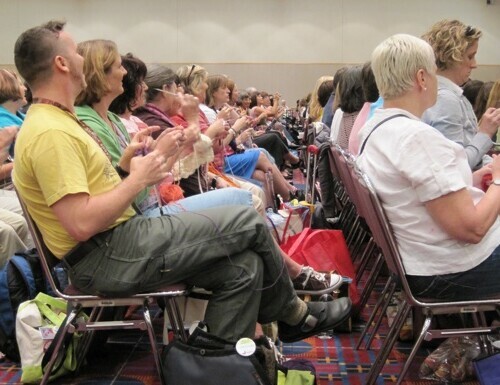 There are a few things about knitting world that this event is reaffirming for me, not the least of which is the community and shared knowledge. Marjan, for example, takes inspiration from Bavarian stitches just as much as from the photography of Brooklyn Tweed. 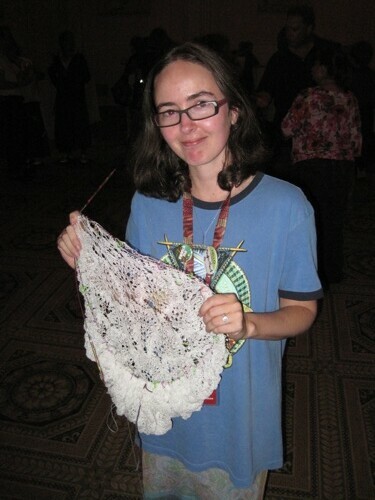 Cat Bordhi happily puts aside her circulars to knit on two straights if it means the World Record people require it. If you are any knitter at all knitting any particular pattern and need sudden help, another knitter will come rescue you. Everyone is learning from each other. 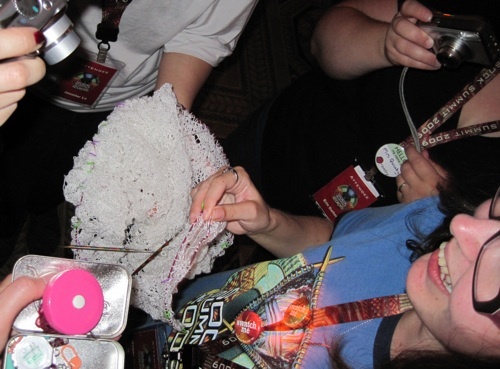 And if, say, you are Meg and you pull out your lace wedding veil and realize there is a dropped stitch situation going on, in the middle of a Sock Hop, the other knitters will all stand around and support you while you go ahead and fix that. Also, if the Guinness Book of World Records shows up, this means that over 1200 knitters will show up and blow the previous Australian-set world record out of the sky, and still even feel a little bit bad about it for the Australians. 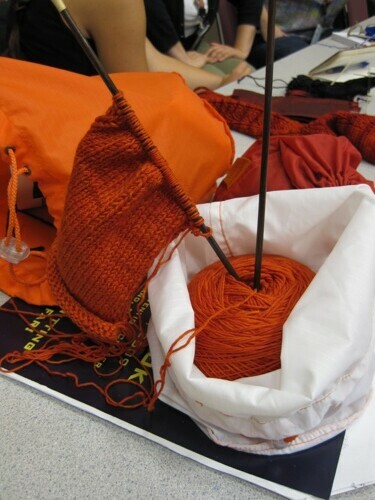 Pretty cool, using yarn to set a record. 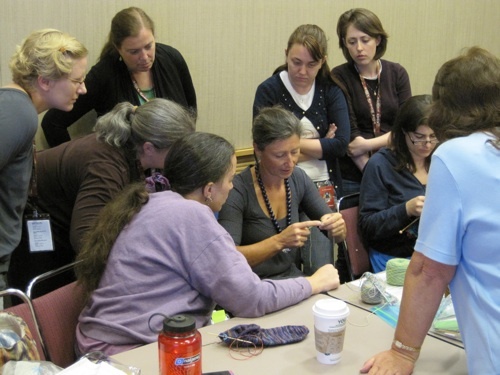 Also it’s pretty cool to hang out with this many knitters for this many days. I’m sure we’re all going to go through withdrawl by Monday. Good thing it’s not Monday yet. More tomorrow, folks, more tomorrow. I know Meg! I’m going to take credit for her asking everyone to knit on that project-I-do-not-mention-by-name/i>; she probably already had the idea, but I voiced it in public, and didn’t get to go to Sock Summit, so I’m grabbing the glory where I can! And I see MrsQuimby, too! See? 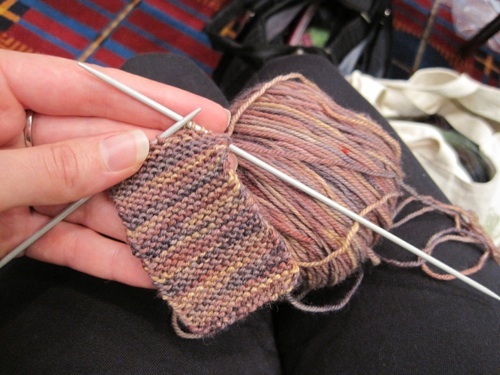 I was so excited about the vicarious Sock Summit-ing I screwed up the html…ugh. 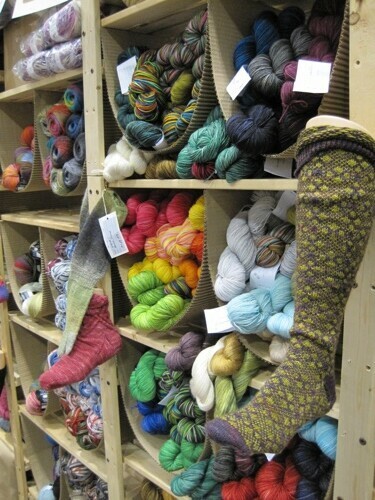 Thank you for sharing your Sock Summit experiences, it’s great to feel like I’m sharing in the event from the other side of the world, even if it’s only by voting in the dye for glory comp and reading your blog! The last photo is a beautiful riot of colours! I hope you’re taking notes for your next academic paper! I just cast on Yarnissima’s Firestarter sock. Your blog’s a delight. Thanks for sharing all the photos and stories! LOVE. thanks for sharing this in real time. 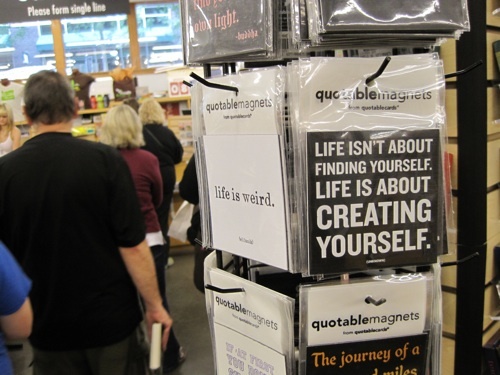 How amazing… I just keep saying/writing/thinking HOW AMAZING!!! I’m really enjoying reading your tales of Sock Summit. Your excitement and joy are palpable. 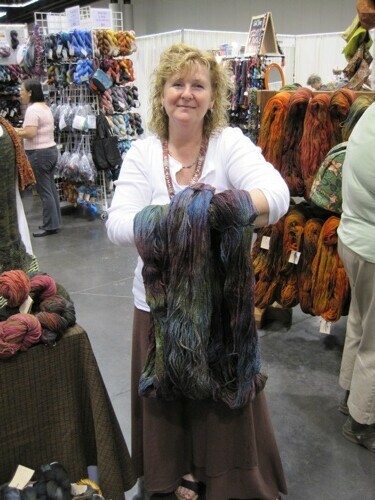 I am shopped out but now am going just to be in the milieu on this lovely day and then there is the RAVELRY party tonite. Glenna, I found myself scanning the crowds for you. Will try again today, would love to meet you in person. I am casting on the stitches for your silkgarden socks with some alchemy yarn bought yesterday. SInce I couldnt get tickets for the SockHop, I appreciate, as usual, reading your post. Love the socks in the last pic, great knee highs. There is going to be a full recap of stash enhancement at the end right? Sounds like a blast! I feel like I’m experiencing what it must be like to be there a little from your posts. Wish I was there! I am so jealous, I wish I was there! Thanks for sharing Glenna! I am going to try my “bestest” to get there next year! Great photos!!!! Thanks for the update. It looks like so much yarny fun! Thanks for sharing, all the photos made me smile! Utterly amazing. Looks like it was beyond incredible! 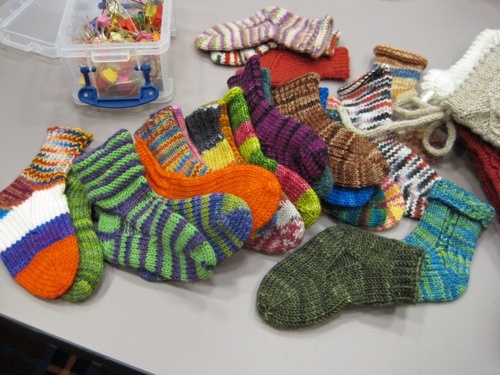 I have never knitted with other knitters before, so it sounds like loads of fun! Is that last picture with Turtlegirl76? 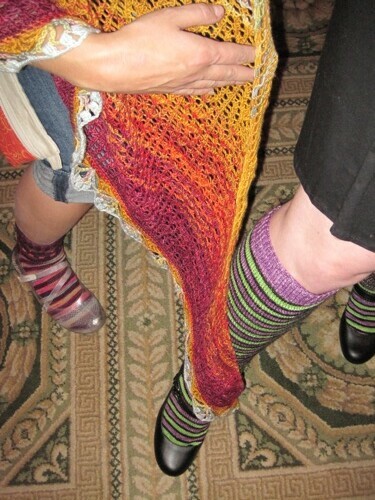 I think that’s her Charlotte’s Web shawl, and her clear shoes, too!